“We will no longer surrender this country, or its people, to the false song of globalism.”— Donald J. Trump, April 27, 2016. Donald Trump has asserted his standing as the presumptive Republican nominee by delivering a foreign policy speech today at the Mayflower Hotel in Washington DC. His denouncement of the abandonment of Christians in the Middle East was very moving– and his desire to strengthen and promote Western Civilization is, in itself, a formidable message to the evil elements that are destroying our society. The fact that Trump would invoke Western Civilization to “inspire positive reforms around the world,” should also be a message of hope for Europeans, who are suffering the consequences of Islamic extremism under the governance of Euro socialists. Trump also delivered a kick in the international Communist gut with his statement, “We will no longer surrender this country, or its people, to the false song of globalism.” Wow… this statement alone is worth its weight in gold. 2016 Presidential Election, Communism, Donald J. Trump, Foreign Policy, Globalism, Marielena Montesino de Stuart, Marielena Speaks, Marielena Stuart, Mayflower Hotel Foreign Policy Speech, United Nations. Our country has descended into a socialist abyss of immorality which is destroying society from every angle. This dangerous descent is rooted in laws which go against our basic humanity– by supporting the murder of babies through abortion and through the abandonment of marriage between one man and one woman as the only natural union for the continuation of humanity. 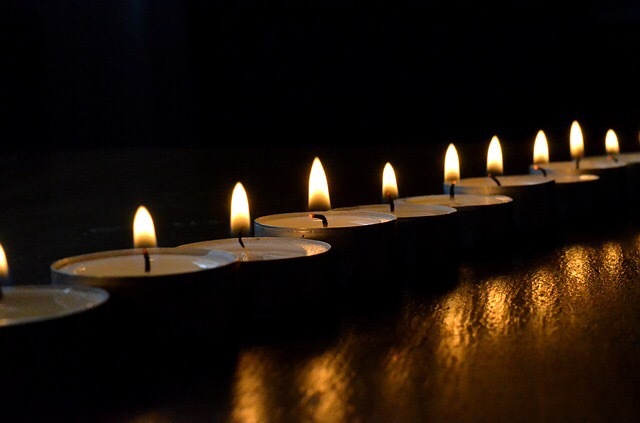 What follows from the aforementioned chaos is complete economic disorder and confusion– because the basic foundations of a healthy society, traditional marriage and value for human life are missing. One example of this chaos is the much-discussed crisis in our Social Security system. Yet, American legislators choose to omit from their discourse one fundamental truth: we have lost millions of contributors to the Social Security program because they were not allowed to live. So many in fact, that since Roe vs. Wade the death of Americans through abortion exceeds the population of Great Britain. This chaos is pervasive and persistent. It’s called Communism. This chaos is evident through the nefarious effect of United Nations socialist policies involving population control in African nations and in areas of the world that do not even meet a population growth that would ensure the continuation of their societies and cultures. This chaos is evident in the crisis of the Middle East– and how China is standing by, watching the Middle East fall apart, in order to reap the benefits of a “sustainable development” region that they can control economically. In fact, this is already happening with China’s economic presence on the banks of the ancient Nile and sub-Saharan Africa– and throughout the Middle East region. Frankly speaking, Communist China is everywhere– and it is relentless in its agenda to control energy sources, and in its determination to be a major “stakeholder” (a globalist term) in the internal facilities that make business activity possible, such as communication, transportation, and distribution networks, financial institutions and markets, and energy supply systems. The bottom line is this: we are fighting a war on many different places– but the enemy fueling these wars is one: COMMUNISM. As such, I am respectfully asking my readers to be extremely careful about being drawn into conspiracy theories, which only serve to confuse and isolate the individual from the clear objective: to combat Communism wherever it is– which today has metamorphosed dangerously into programs that exist right under our noses, on a local, state and federal level. It is the responsibility of every freedom-loving individual to learn to identify these dangerous Communist programs– through facts, NOT through conspiracy theories and theorists who will drain your precious time and create even more confusion. Keep your eyes on the ball. Communism is humanity’s biggest enemy. Over 120 million lives have been lost at the hands of communist regimes in different parts of the world. By fighting against Communism, you will fight against Islamic extremism and totalitarian regimes who all receive support from the Communists at the United Nations. Keep your eyes on the ball. 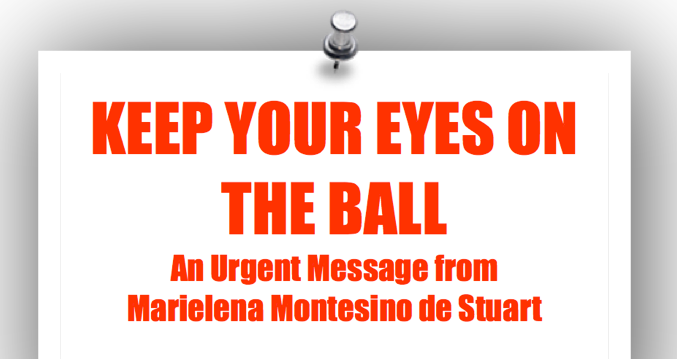 Communism, United Nations, Marielena Montesino de Stuart, Marielena Speaks, Marielena Stuart, China, the Middle East, KEEP YOUR EYES ON THE BALL: An Important Message from Marielena Montesino de Stuart. Pakistanis who convert to Christianity suffer terrible persecution inside their country. Their only chance of survival is to flee. Many of these Pakistani Christians seek refuge in Thailand where they wait as UN-registered asylum seekers to be processed by the UNHCR (the UN High Commissioner for Refugees)– but the UN can take years to process their documents. In the meantime they suffer inhume treatment inside Thailand. As a survivor of Fidel Castro’s brutal communist regime, I cannot join Berliners while they raise their champagne glasses to celebrate the 25th anniversary of the fall of the Berlin Wall, at the footsteps of the triumphant Brandenburg Gate. You see, over one billion human beings did not get to drink the celebratory champagne this weekend, because they are still suffering under communist dictatorships in many parts of the world. As such, the governments of China, Cuba, Vietnam, Laos and North Korea continue to isolate, oppress, torture and execute their people. The most dangerous one to humanity is China, because of its political and economic power worldwide, as well as its dangerous expansionist agenda in the South China Sea and its chokehold on Hong Kong. In fact, China is economically so powerful that it has become America’s banker. It should not come as a surprise that President Barack Obama is on his way to Beijing for an economic summit, to make sure that the Chinese communist leaders are appeased and happy with our Sino-American trade and political deals. President Obama is expected to promote the secretive Trans-Pacific Partnership. And I have news for you. The Islamic extremist movement, in its various manifestations throughout the Middle East, as well as North and Sub-Saharan Africa, has Marxism sewn into its thawb. Just look at the supporters of these Islamic-extremists: China, Cuba, South American nations that are members of the Marxist-inspired São Paulo Forum, and almost every enemy of the United States. Indeed, the fall of the Berlin Wall brought together a Germany that had been divided by communism, but it appears more and more that letting go of the wall was a well-orchestrated move by the Marxists, which led much of humanity to believe that communism had ended. I’m not so sure, however, that the leaders of the free western nations pushing for the fall of the wall were so credulous in this respect. But letting the masses think that freedom was in the air was the political message that had been prepared for the West, regardless of its veracity. The reality is that communism simply went underground and resurfaced as the United Nations massive international socialist initiative known as Agenda 21 (Sustainable Development). Even though it has never been approved by the U.S. Congress, Sustainable Development is found at local, state and federal levels in the United States. The “sustainability” projects introduced in our communities through Sustainable Development have changed the landscape of our nation, by transforming everything from our health system and public education, to the way that we do business. A key part of my campaign for the U.S. Senate (on the ballot 2012) involved exposing Sustainable Development, its nefarious depopulation agenda and its attack on the traditional family. During the last two years, Sustainable Development has advanced aggressively in the U.S. through Obamacare (Affordable Care Act). Today, Sustainable Development has reached just about every corner of the planet. Even the Vatican has jumped in the sustainability bandwagon. Earlier this year the Pontifical Academies of Sciences and Social Sciences held a joint sustainability workshop. In addition, Vatican officials are regular attendees at Sustainable Development summits. At the heart of Sustainable Development is the concept that human beings are enemies of the environment; consequently, their consumption of food, transportation, private property, way of life, reproduction, education and culture must be controlled, in order to achieve “sustainability.” Sadly, trusting and uninformed individuals in our communities have been taught that this agenda is important, in order to be a responsible “global citizen.” Unfortunately, most young people have grown up with “sustainability,” so they have been conditioned to accept it. Others never learn how they are slowly giving up their rights. Welcome, ladies and gentlemen, to international socialism– through power, greed and control. This is why it is critical that citizens take the time to read and learn about this United Nations program, which has embedded itself in our government system. Two of the most active ambassadors of Sustainable Development are China and Cuba. So, forgive me for not raising my champagne glass with Berliners, on a night such as this. But I do raise my eyes to heaven in prayer, so that humanity will wake up and have the strength to stop the erosion of our freedom. Agenda 21, Sustainable Development, Agenda for the 21st Century, Environmentalists, Communism, Obamacare, Fall of the Berlin Wall, The Brandenburg Gate, United Nations, Marielena Montesino de Stuart, China, Cuba, Truth, Information, News, International, Youth, Current Events. Can you count on UN peacekeepers to keep you safe? ISIS (Islamic State) 2014 map showing the caliphate five-year plan. The United Nations is touted as the “peacekeeper”– in a world filled with violence. What will happen if ISIS (Islamic State) carries out its plan to take over Spain, as part of the recently-announced caliphate projections? (See featured map). United Nations, Marielena Montesino de Stuart, News, International, UN Peacekeepers, Current Events. Any ads that appear below are automatically generated by WordPress and are ABSOLUTELY NOT endorsed by this website; however, please do read my related posts below. The bureaucrats at the UN Palace of Nations in Geneva must be trying to find creative ways to justify their cushy positions. Their latest cause célèbre comes in the form of an investigative inquiry, which culminated in an advisory letter aimed at sending Kim Jong-un to the International Criminal Court (ICC). But will they do the same against Fidel Castro?– based on his 55-year history of Communist oppression, starvation, torture, imprisonment, executions, human trafficking– and every type of human violation ever known to mankind. I speak from a definitive position, based on experience. I was born and raised in Cuba under Castro’s brutal regime.